Action figures are cool. When I was younger I loved playing with G.I. Joe, He-Man, Transformers, and even green army men. With them I imagined all sorts of stories. Sometimes I imagined what it would be like to be a few inches tall. My room would be huge! Climbing onto the bed would be like scaling a cliff, and getting off my desk would be dangerous indeed. 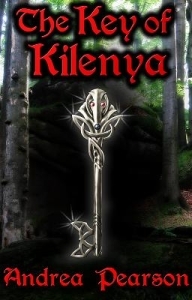 I was reminded of this dream when I read the Key of Kilenya by Andrea Pearson. I want more "small" scenes in the next book. The story starts with a pair of wolves and ends with hideous monsters. It has sentient clouds, creatures in caves, evil forests, and shrinking. This is a fun book for teenage readers who like fantasy. Fourteen-year-old Jacob overcomes many challenges as he travels through a strange and varied world. After a while the chapters started to feel episodic, and sometimes the story got lost. But, over all, there's enough going on to keep things interesting and it left me with many questions about the next book. You don't have to take my word for it. You can listen to the author herself. Check out her video introducing the book. You can also buy the ebook or paperback or even pick up a signed copy. I'm glad you liked the review. The book was fun to read. I agree that first books are hard because all the skills are new. I'm looking forward to reading more of your work in the future.